I always look for as many alternative lights and locations as possible to create something different. 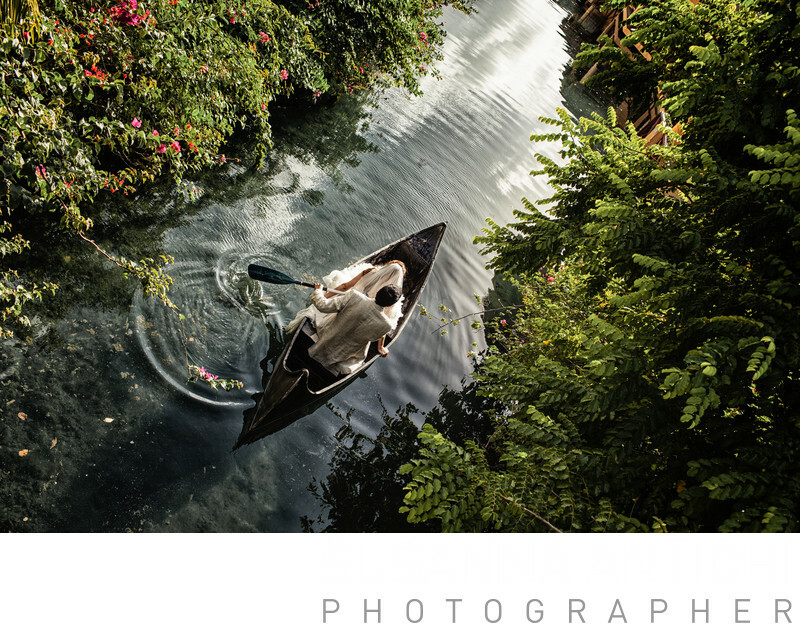 I found a canoa at the side of the river, it was broke but I was imaging in my mind the scene and the result so I asked to bride and groom to jump carefully on it and just row to the light direction. I winded my camera strap around my wrist, I zoomed, I composed and I literally tried not to fall from my tree where I was shooting. Just to get one shot! Location: Grand Palladium Resort, Playa del Carmen, Riviera Maya, Mexico. Keywords: beach wedding venues (381), bridal photographers (339), destination weddings (624), engagement photographers near me (624), marriage photography (624), new York wedding photographer (213), traveling wedding photographer (531), wedding photography professional (531), wedding reception photography (213).